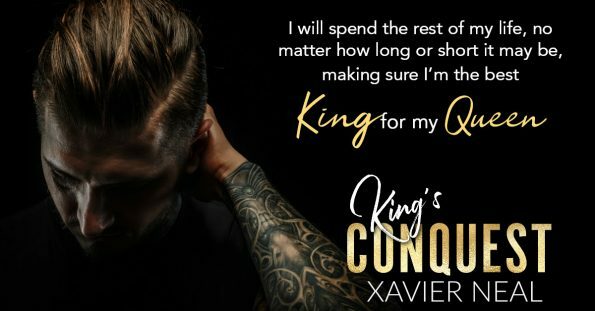 Review – King’s Conquest by Xavier Neal – 5 Torturing, Hot, Adrenaline Filled Stars!! 5 Torturing, Hot, Adrenaline Filled Stars!!! King will stop at nothing to reinstate order; he will destroy anyone who stands in his way. Is King prepared for the price his conquest will cost the Misfits? Xavier Neal has truly brought out her darker side in this second book of the Misfits series, and I loved it! I was held captive by this story from start to finish and devoured it in one sitting. Without any doubt, Xavier Neal has written an MC Romance, something which she hasn’t before, and is delivering an excellent series. Imani showed her true strength in this second book, and just how dedicated she was to King, and the Misfits. It was also clear how much influence and guidance she showed them. I admire her, and how she wouldn’t allow things to scare her away or stop her following her career. This story holds so many revelations, many of which I did not see coming. I love how Xavier Neal has a talent, for throwing in a curve ball or six, giving us, the readers, that extra captivating factor, that has us struggling to put the book down, and waiting with abated breath for what will happen next. I cannot wait to delve into book #3 of the Misfits series. Kings Conquest ends on a cliff hanger, as did book #1 and as frustrating as it is, the delivery of that cliff hanger is so well written, it’s easy to forgive Xavier Neal for the torture, as we wait for book #3. If you love MC Romance stories, with a darker side, and with humour thrown in for good measure, the Misfits Series is for you.